In a Nov. 17 letter addressed to Chancellor Pradeep Khosla, Interim Executive Vice Chancellor Peter Cowhey and members of the Academic Senate, hundreds of faculty and community members called for administrative legislation that would make UCSD a sanctuary campus. This, according to the letter, would lessen the “grave threat” to undocumented students and faculty posed by President-elect Donald Trump’s proposed immigration policies. “We call upon the university to immediately undertake measures to make the campus a sanctuary for undocumented and other students, staff, contract workers, and their families who have been targeted by President-elect Trump’s proposed policies,” the letter stated. Assistant professor of sociology Abigail Andrews and assistant professor of political science Tom Wong organized the letter with help from the UCSD Faculty Collective. “We want to send a message that UCSD embraces all of our community and that no matter Trump’s policies UCSD will take concrete measures to protect every one of its members,” Andrews wrote in an email. 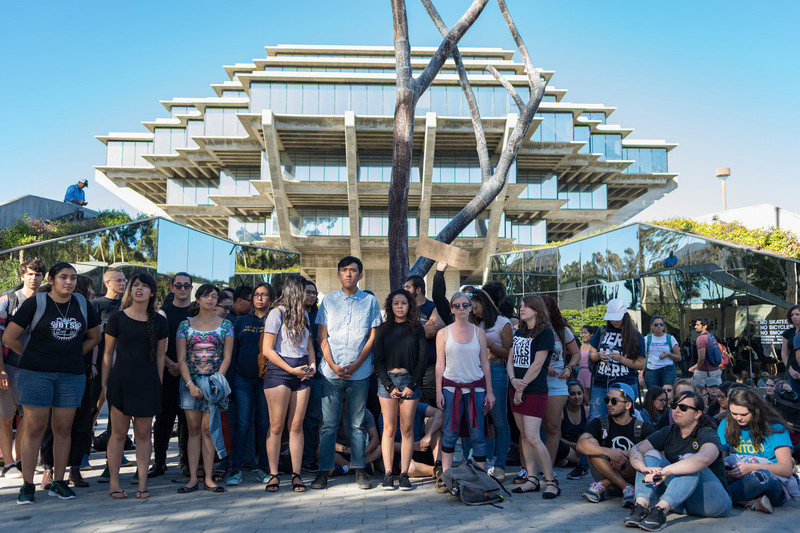 Signed by 302 faculty members and 1,058 community members as of Monday morning, the joint letter included a list of nine “actionable steps” that the Academic Senate and the university administration could take in order to make UCSD a sanctuary campus. One calls for UCSD to reaffirm its policy against cooperating with authorities from U.S. Immigration and Customs Enforcement in carrying out raids and deportations. Another urges the university administration to expand legal services for undocumented students, staff, workers and their families, citing UCLA, UC Irvine and UC Berkeley, universities that currently fund on-campus immigration attorneys. Earl Warren College senior Clara Bird said she signed the letter to show support for her friends from other countries. When asked about the amount of signatures the letter had received since it was made public on Thursday, Bird attributed the strong support to the community at UCSD. “The support that this petition has received is a direct reflection of our diversity, academic prestige and caring community,” Bird said. Immigration reform was one of the main themes of President-elect Trump’s campaign and continues to be a top priority as he and his team prepare for the White House. At the end of October, the President-elect announced his 100-day plan, called “Donald Trump’s Contract With The American Voter,” in Gettysburg, Pennsylvania, where he outlined his intention to remove “two million criminal illegal immigrants” and cancel all federal funding to Sanctuary Cities. It’s unclear how the Trump administration will respond to “sanctuary campuses,” which have formed around the country following Trump’s election. Chancellor Timothy White of the California State University system expressed his support for the concept of sanctuary campuses in a recent interview with Time magazine. White’s University of California counterpart President Janet Napolitano issued a post-election letter signed by her and 10 other UC leaders reaffirming that they “remain absolutely committed to supporting all members of our community and adhering to UC’s Principles Against Intolerance,” but the UC President has yet to make a public statement regarding sanctuary campuses specifically. As Director of Homeland Security under the Obama administration in 2012, Napolitano carried out the Deferred Action for Childhood Arrivals policy, which halted deportation of migrants who came into the country as children. Pingback: About Sanctuary - Happy Homeowners.